I have so may blessings in this life to be thankful for. As silly as it is, I'm thankful for this little ol' blog and my blog friends too. A very Happy Thanksgiving to you. May it be full of beautiful blessings. It's always a pleasure to stop by Dear, blessings to you and yours! Hope you have a wonderful holiday with your family! I'm thankful for your blog and the lovely lady that posts there. ;-) Have a very blessed Thanksgiving! Happy Thanksgiving Stacey! Hope you are enjoying your day! Certainly, I'm just as silly! Happy Thanksgiving, my old blog friend! Happy Thanksgiving. I am thankful for your friendship and little ole blog too. Hope you had a very lovely Thanksgiving with your family, Stacey! We're on our way home from Charlotte. I'm thankful for you and your blog too! Hope y'all had a terrific Thanksgiving! Our Thanksgiving was wonderful. I hope yours was too. Can you believe it's December in just a few hours?! 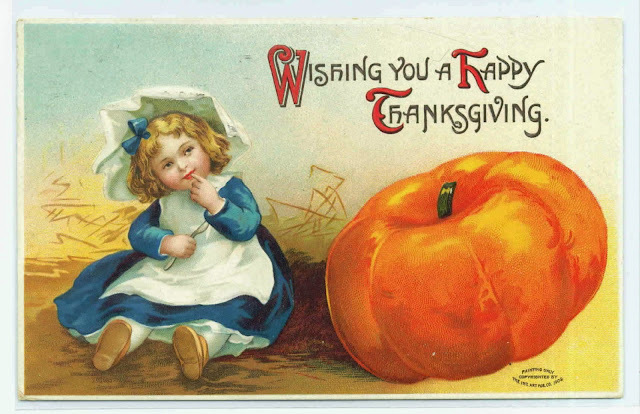 Love the vintage Thanksgiving card! Hope your Thanksgiving was wonderful! I'm thankful for our online friendship, and I've been reading a few of your posts to catch up. Love your planked mantel! What an adorable vintage Thanksgiving print. Hope yours was wonderful. Your blog...not silly at all. Blogging has put me in touch with some wonderful friends all over this country. You are one of them and you inspire and delight me with your post. I am thankful for you. Stacy, hope you had a wonderfully peaceful and cozy Thanksgiving! I'm sure your Thanksgiving was wonderful and I'm thankful for you too, sweet friend. I'm a little late but i hope your Thanksgiving was wonderful! Not silly at all, Stacey, my blog is right up there on the top of my thankful list as well. Love the connection I have made with wonderful people like you! Hope you had a wonderful Thanksgiving! I am so late, but when I read this post, I just had to respond and tell you, that I am thankful for you too! You add sunshine to blog land!